This vignette premiered on my blog last year but I don't think many of you saw it. I didn't have many followers. I "love" container vignettes. The purchase of this cute little pillow from my friend's shop, The Tattered Angel, inspired this Valentine's Day Vignette. The heart garland is also from the Tattered Angel. 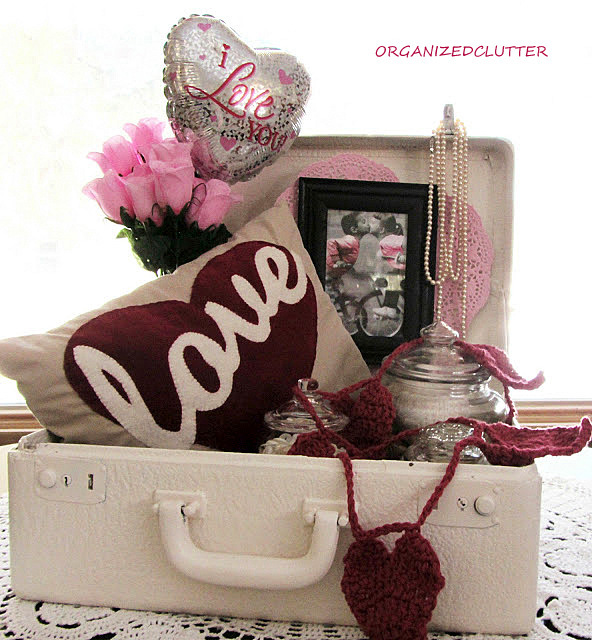 I have jars of buttons and thread like in my Cupid Awake, Cupid Asleep suitcase vignette. 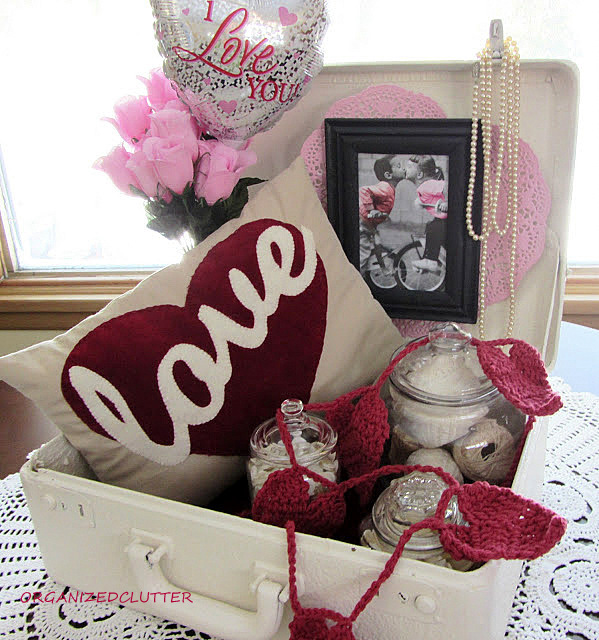 This vignette also features a framed Valentine's Day Card, paper heart, pearls, roses and heart balloon from the Dollar Tree. Very pretty vignette,Charlene. thanks for posting it again. That's so cute. Glad you posted it again.....and glad I found your sweet blog. I love your painted suitcase. I picked up 2 suitcases that I keep toys in, but I think they need a facelift. I've never thought to do this. I have an adorable red train case that I foresee doing something with. OMG!! This is so darn cute!! I have to paint that suitcase that i have before it kills me!! LOL!! 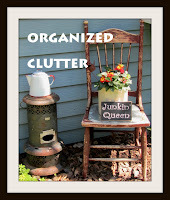 I love this idea Carlene. 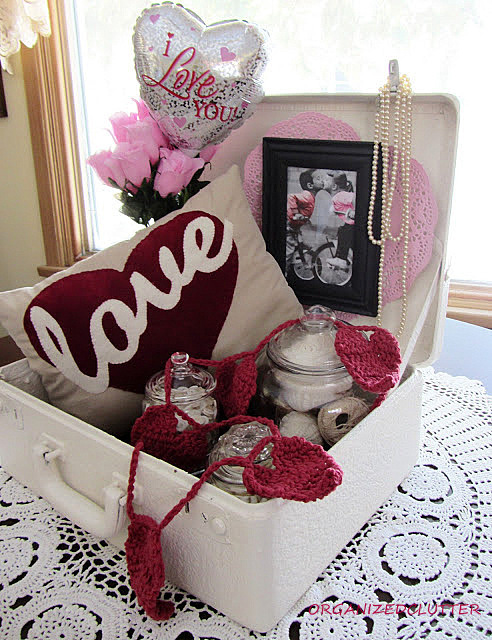 Beautiful Valentine vignette. Like everyone else, I'm jumping on board. I need to pull out the vintage train case I purchased and do something cute and attractive. Thanks for the idea. I love it! You are the queen of the suitcase vignettes! Honestly, you definitely have a way with them. The knitted heart garland is just too cute. People are so creative. I love the little pic of the boy and girl kissing in the background. So sweet! Oh, I love these too! I have a Board on Pinterest with them. Very pretty! Oh, so cute! You put together the most fantastic vignettes! Love visiting here. . . I love it. I wondered what kind of paint you used to paint the suitcase. I am getting ready to paint on. Thanks!